Sheringham West signal box came from Wensum Junction, just outside Norwich Thorpe station In 1982 it was moved to the North Norfolk Railway. 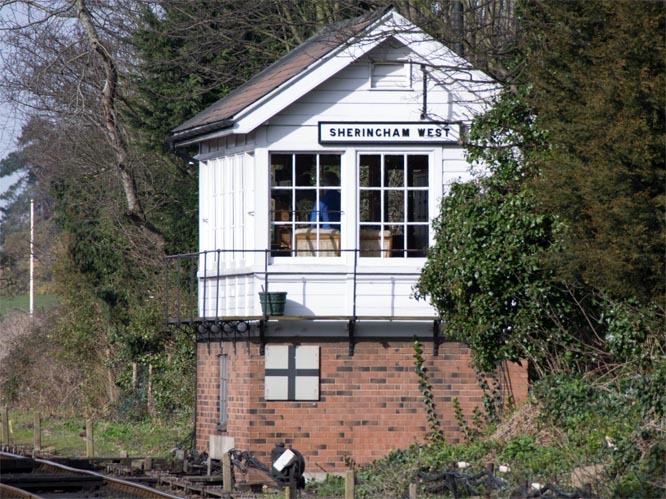 This West box controls Sheringham station. The old Sherringham East box has been out of use and on display on the platform at Sheringham staion. The East box has now been moved back to somewere near to its old place. The NNR now has a main connection and trains can now cross over the road between the two stations on certain days of the year. The Sheringham level crossing was re-opened by Pete Waterman on the 11th March 2010 when Britannia class 70013 Oliver Cromwell crossed over the crossing with THE BROADSMAN a steam train from London Liverpool Street station in London to Holt. The next station on the NNR is Weybourne station and is a passing place and often two trains will be in the station. Weybourne has the NNR engine sheds and workshops. Holt station is not now were the old station was, as when this part of line closed a road was built on part the old railway bed. Some of the site were the old station was, has been built on. The new NNR station at Holt has all new platforms but the signal box and the station buildings and other parts, have been saved from other M&GN stations.